First Air supplies world class filtration products to the auto industry. Our Spray Paint Booth Filters are the best filters for the cleanest paint jobs in the world. FirstAir Ceiling Media Is Manufactured By FirstAir Industrial sales, FAIS INC.
FirstAir diffusion ceiling media is designed for the final filtration of supply air to down draft paint spray booths, and to arrest all paint damaging particales larger than 5 microns in size. While eliminating those particles from the airstream, this blanket media creates a very uniform and downword air distribution throughout the spray cabin chamber, preventing air turbulences that could carry particles to the painted car body. FirstAir downdraft ceiling media is expertly suited whether for use in auto re-finishing or the spray plants of OEM auto assemblers. FirstAir synthetic fiber based diffusion media is constructed from a careful designed mix of polyester unbreakable fine fibers structured into a progressive density air filter mat. This results in high depth loading and low initial pressure drop, yet long life performance. All fibers are individually coated throughout the depth of the mat with a special adhesive in a saturated bonding process to ensure that no fibers or paint damaging particles can be separated from the mat through the high velocity air stream or vibration in the system. 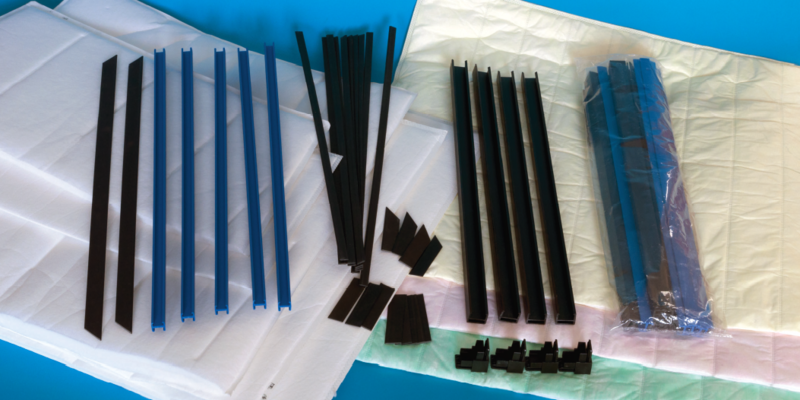 On its clean air (exit) side the media is particularly dense and re-inforced with a woven filament scrim to add strengh and support and imprinted with logo, and filtration class. The media and its adhesive quality has over 5 years guaranteed shelf life, it does not migrate paint damaging particles, has 100% coating of all fibers, a thickness of nominal one inch or 20 mm. and is self extinguishing. FirstAir media conforms to international standards in the U.S.A. and the E.U., and are resistant to moisture, solvents and are silicone free.